A few weeks ago, I introduced the Digital Draw, a box in the newsroom containing colorful strips of paper with various technology tools listed to produce journalism. 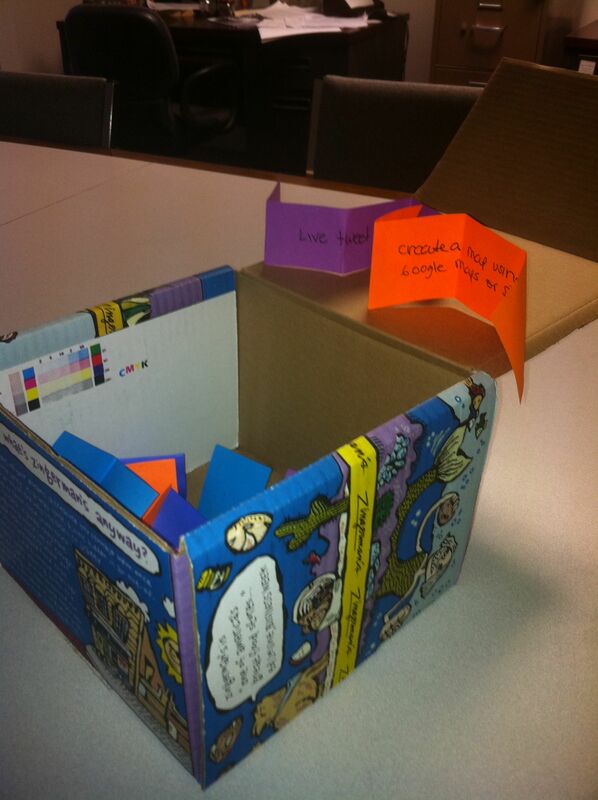 Every Friday, my staff draws from the box and has a week to incorporate one of the suggestions in their work such as crowdsource a story from Twitter, create a Storify or timeline using Dipity, live Tweet a meeting or produce a photo slideshow using user-generated photos. We’ve had success with this effort, and I wanted to share with readers some of our work and seek feedback on what else we could be doing or exploring. Cops and courts reporter Ben Baird selected “create a Google map“ to incorporate in his reporting. He applied it to a story he wrote on a series of retail thefts in Saline. A week earlier, he picked “post to a blog,” and did so, writing about a ridealong with a sheriff’s deputy and incorporated a video. Chelsea/Dexter copy editor Erica McClain chose “create a Storify,” and covered the arrival of University of Michigan football players in New Orleans for the Sugar Bowl, based on chatter on Twitter. General assignment reporter Krista Gjestland drew “create a podcast,” and interviewed a gap year student in Ghana using ipadio.com for a phonecast. The first week, I drew “create a sound slideshow,” creating a photo slideshow and incorporating the voices of residents weighing in on cuts proposed to the Humane Society of Huron Valley and the second week I picked “create a photo slideshow using user-generated photos,” using photos submitted by the Milan Public Library depicting their holiday activities. County government and entertainment reporter Sean Dalton selected “hold a live chat” and “crowdsource photos for a slideshow.” He’s still working on both, but says he has sent out Tweets asking for participation. In the meantime, he crowdsourced a story on Twitter. City government, health and environment reporter Amy Bell selected “create a Google map” to complement a story and “crowdsource a story using social media,” which she did after seeing The Bling Thing in Saline bragging on Facebook about its holiday sales. An Eastern Michigan University graduate student contacted me recently about an independent study he had under professor Michael McVey, a contributor to this blog, in the School of Education. He was studying my ideaLabHeritage blog and wanted to ask me some questions via email as part of his class. You can imagine how stunned-yet-honored I felt that a student was studying my blog, and I was more than happy to answer his questions. I thought readers may be interested in this as his questions and my answers pretty much highlight my first year of ideaLab work and this blog. Q: Tell me about the establishment of the blog. Where did the idea come from? How did you go about setting it up and decided what topics to cover? A: I created the ideaLabHeritage blog in July 2010 after I was named to the Journal Register Company’s ideaLab. I wrote about it under the page “ideaLab forms.” At our first JRC ideaLab meeting in Philadelphia, board members encouraged every member of the ideaLab to set up a blog and Twitter account as I had. The type of topics to cover on my blog was a no-brainer as they had to be associated with my work in the ideaLab. Many of the posts are associated with learning different technologies and applying them to reporting. I decided right away that whatever work I did in the ideaLab should be written about and shared publicly as it would be beneficial to journalists and aspiring journalists alike, and would be a good way to gather feedback, as we try to figure out the future of media in a world becoming increasingly more technologically adept. I thought it was important to share my ideas, seek input and feedback, collaborate and partner. My initial idea was to create ideaLabHeritage, a local arm of the JRC ideaLab, made up of veteran journalists, student journalists, educators, IT professionals, newspaper advertising and production staff, as well as our audience in Washtenaw County, to brainstorm, innovate and execute projects exploring new forms of technology to help move journalism forward. I asked for volunteers and invited people who I thought might be interested in participating. What I found, however, was that my level of commitment was much stronger than the desire of those who expressed initial interest. The only volunteer to actively contribute has been Eastern Michigan University professor Michael McVey, who played a vital role in my first project, a historic walking tour podcast of downtown Saline, so in the spring I folded my staff into the group and asked each reporter to sign up for a technology tool to learn and teach. Q: Have you been able to add any of the technology discussed in various posts into your newsroom? If so, how’s that going? How are your reporters utilizing the technology? Q: I know your editor of a group of papers that belong to a larger group. Do you share any of the information gained from various conferences and other meetings about new technologies with editors from other publications? Talk a little bit about the reception things such as iMovie have gotten from other editors. A: I have always been big on sharing. I think my desire to share with colleagues ideas and successes that I’ve had in the field, and open communication with company leaders led to my appointment to the ideaLab, as I was the only member who did not apply. On my blog, I have shared what I’ve learned at conferences and, most importantly, while I’ve been at conferences, I’ve “walked the walk,” putting these tech tools I ask reporters to use on the job to use by live tweeting and live blogging, and capturing audio using ipadio.com, the tool I’ve experimented with the most as a member of ideaLab. In addition, I’ll send a companywide email sharing my blog posts, and share links on Twitter and Facebook as many of my followers are fellow editors and reporters. Some people seem receptive and thank me, but, for the most part, no one responds. However, I closely watch the stats on my blog after I send an email with a link and I do see them climb, so I know they are checking it out. For example, today I posted “Using Google Voice for Journalism” and shortly after I sent a link to editors in our Michigan cluster of papers, I had 22 views. My best day was 264 views, the day I posted “A reporter with today’s tools should use them.” My total number of views since establishing the blog in July 2010 is 6,376. I’ve been asked by one of the executive editors in the Michigan group to create a toolbox incorporating definitions and tutorials of all these tech tools highlighted on my blog, and more found on the company intranet and explored by other ideaLab members, to serve as a resource companywide for editors and reporters. I’ve delegated this project to my online coordinator, and I am advocating for it to be open to the public. The key will be to get reporters and editors to actually think of using these tools to enhance their online storytelling, engage their audience and provide more visual storytelling, and then remind staff regularly that this resource exists. Q: I am an avid user of Twitter. How do you feel about the impact the medium has had on journalism? I’m currently a sports writer. For sports reporters, it seems like you get better quotes from athletes – and not canned quotes – from reading their Twitter feeds. Do you see Twitter possibly ending the need for the face-to-face interview? A: Twitter has had a tremendous impact on journalism and that impact will grow even more in the coming year, especially with tools like Storify to aggregate content, and as reporters learn its value as a crowdsourcing and audience engagement tool. I’ve been using Twitter as of late to seek input from our audience and local experts for our #whatsnextmi project, as well as a Twitter newswire, which I haven’t devoted the time I should to and probably will delegate to our political reporter, Amy Bell, for the 2012 election season. I will admit that I haven’t put the time into Twitter that I should and I haven’t used it conversationally, as we should, but rather to push out links in a rushed fashion after editing and then posting stories. I applaud you for understanding the value of Twitter and incorporating it in your everyday reporting. That really is the future. The shooting at Virginia Tech and the college newspaper’s reporting on the incident, sourcing through Twitter and posting frequent updates on the social media site, is a testament to that. Q: How mobile are the reporters in your newsroom? I agree with you on tablets beings the new “it” thing. Is there a way you could equip all your reporters with tablets so they could submit breaking news briefs and information via Twitter without needing to be in the office? A: All of my reporters have Netbooks, with Verizon Wireless built in, so they can post live from the field and engage our audience on social media. Our reporters are completely mobile. Frankly, I am surprised that all reporters at every media outlet aren’t. This isn’t the future; it’s now. Q: How do readers of your publications feel about the blog? Do they see it as an inside look at the future of journalism? A: I haven’t had a lot of feedback from readers of the eight publications I am involved with on my ideaLabHeritage blog. I try to engage them by posting links on each publication’s Facebook page and Twitter account. The norm seems to be that if they’re satisfied, they don’t comment or communicate. I see that reflected in the low number of comments posted on our online stories and on our Facebook pages. I am hoping this means they’re either content or busy, and not disconnected or disinterested. They do engage us when they’re not happy, such as the reaction we received over our decision to publish a photo of a local wingwalker as he fell to his death. In that instance, as a protest was launched by the victim’s sister on our Manchester Facebook page, we decided to remove the photo and held a live chat to explain why. Ninety-nine percent of the audience from that chat had a background in journalism with no connection to the community. Again, it speaks to the fact that we just don’t have a lot of audience interaction when readers are satisfied. We’re actively trying to build better audience engagement through social media and by forming a Community Media Lab. Q: Do you ever take any of the posts from the blog and use them as editorials on your opinion page or is the blog strictly online? A: I do repurpose some of the content from my blog for print when it makes sense. For the most part, though, I don’t because I incorporate a lot of hyperlinks, which, of course, are lost on print readers. I think the print reader, right now, is a different breed than our online reader. Our web readers have higher expectations. They want linked source material, database-driven content, rich visual storytelling, info graphics, timelines, maps, audio, video and they want to connect, interact, have a conversation, and that’s all fun and exciting stuff for me. Very soon, I think everyone will get there. Print will be converted to online and everyone will be getting their news on a mobile platform. Feel free to add any additional thoughts or comments. Recently, I restructured our newsroom so that we are better serving our online readers. We have a beat structure in which we localize news that affects all of the communities in our coverage areas, rather than having one reporter as the sole person responsible for a defined area, splitting reporting time between two communities. This will help increase our page views and drive more traffic to Heritage.com as all of our content will attract a wider audience, but still retain local relevance and appeal. Lastly, if you’re interested in being part of ideaLabHeritage, our Community Media Lab or writing a blog that we host on our website, I’d be happy to discuss the possibilities with you in person. We’re always looking for more contributors. That was my goal as a member of the Journal Register Co. ideaLab. I’ve steadily worked toward it and had successes. But, with staff turnover, I’ve found we’re often in catch-up mode. Last week, I thought about what I could I do to encourage reporters to think more multimedia in their daily reporting. The days of just producing a story and maybe a photo to accompany it are over. We have to provide multimedia content, meaning adding hyperlinks to previous related coverage, source material and other content that will round out the piece; and, if applicable, a locator map, timeline, photo slideshow, video, audio component and/or host live chat. We also have to take advantage of social media to source a story, generate leads, share material and interact with our audience. Earlier this year, I asked my staff to learn a new technology tool related to journalism, teach it to coworkers and add it to the ideaLabHeritage blog. In all, we learned about 17. The problem, however, was my reporters didn’t often think to apply what they had learned to their reporting. So, on Friday, I came up with the Digital Draw, a box containing colorful strips of paper with a multimedia offering written on each piece of paper. Reporter Sean Dalton drew “conduct a live chat,” Amy Bell selected “create a Google map,” David Veselenak chose “live tweet a meeting,” James Dickson had “find a story lead on social media and pursue it,” Krista Gjestland chose “create a podcast” and Ben Baird selected “post to a blog.” To lead by example, all the editors had to grab from the Digital Draw, as well. Tanya Wildt drew “create a Storify,” Erica McClain had “create a timeline” and I drew the same tool as James. Understanding that the digital tool selected may not always complement something each reporter was working on in a particular week, everyone was given the option to pick an alternative from the list. Every Friday, we will talk about what we did, share our successes and talk about challenges, and then stick our hands back in the Digital Draw box and get excited about the next tool and how we can apply it to our work. So tell me, how would you.get your staff in the practice of producing more multimedia-enhanced reporting? I am hoping since my reporters have learned these tools, it’s just a matter of getting in the habit of applying them and identifying, for each article produced, which digital tool will enhance the piece, whether it’s a locator map to set the scene of an armed robbery, Storify to capture what the audience was saying on Twitter while the reporter was live Tweeting or a timeline to illustrate a sequence of events that led to a particular outcome reported in an article. When I was first introduced to www.SurveyMonkey.com I was inspired as to what exactly a journalist could use this tool for. I thought that it would be hard to get readers to respond to questions and you could use that data in the paper. What I found was that millions of people all over the world had already used this tool. They have used it for businesses, schools and several types of organizations. So why not use it for online journalism? Some of the types of surveys we can use with Survey Monkey include customer feedback, product feedback, market research surveys, employee satisfaction and even performance reviews. Not quite as advanced as the performance reviews Journal Register Company has had us learn but they are interesting. Once an account is made (which is free depending on how in-depth the service is) people can start putting surveys on Internet, sending them by email or even using Facebook to get answers to the surveys. Once you get your answers there are many different things you can do with them. Survey Monkey actually looks at the data and gives you results. You can use these for stories, personal use or maybe to look more in-depth at what you are trying to do. The cost is free unless you choose to upgrade it. So have fun, explore and see what you can use from this tool to become a better journalist and online reporter. Note: Another post by contributor Jodie Mason. I was definitely one of those people who snubbed the idea of the iPad at first. The idea of spending $500 on a device that can’t print like a laptop or take photos like my phone seemed insane to me. But after spending about two weeks with the iPad, I can honestly say that is no longer the case. First off, the start-up time can’t be beat. Unlike my laptop, which seems to get slower by the day, I can be online in seconds, checking my e-mail or using the various applications. One thing in particular that I enjoyed about the iPad was the large screen. I am an owner of the Evo 4G, and with its 4-inch screen, it was an improvement from my previous phone. But I still have issues reading downloaded attachments and checking to see if my photos looked good. With the iPad, I can see everything on a large screen, and it’s much easier to type on the larger keypad. I am still getting comfortable with typing on a touch screen, but I found that turning it sideways helped. I look forward to the opportunity to use applications like CoverItLive to live-blog events and discover other applications that will allow me the opportunity to appeal to a wider readership. Overall, the iPad is a welcomed tool for my work. Due to technical problems, reporter Jodie Mason has asked me to post this on her behalf. In the beginning of October, I was given the Echo Smartpen, a pen device that contains a microphone, speaker and time display. Once the cap is removed, the pen is turned on with a small button at the top. After that, you hit the “record” button at the bottom of a binder filled with electronic paper and you’re recording, both on the paper and voice. After you’ve hit “stop,” you simply tap the paper and the recording syncs with the writing on the paper. The pen also includes software that can be easily downloaded to the computer. This software adds the voice recording to the computer where it can be saved and edited, as well as digitally transfers all writing to the screen. Goal: When I received the Echo Smartpen to test out, I was curious to get started. My first thought was also a worry: How is an omni-directional microphone on a tiny little pen going to pick up only what I need. Training: The learning curve with the Smartpen was very short. Once I changed the settings to left-handed, it required only removing the cap from the pen and hitting record. I found that as I went on, I could reduce background noise by pointing the microphone where I needed. Only once did I have to physically shield the mic from surrounding noise. Resources: Everything is included, no additional resources are needed. Simply plug the pen into the computer with the included USB attachment and the software downloads automatically. Obstacles: The Echo Smartpen is best used when during an interview or at a panel discussion. I found it difficult to use at City Council meetings due to the nature of the space, voices carry echo and there’s usually a lot of scuffling. Also, if you’re heavy-handed at writing, you can sometimes hear the sound the pen on the paper. 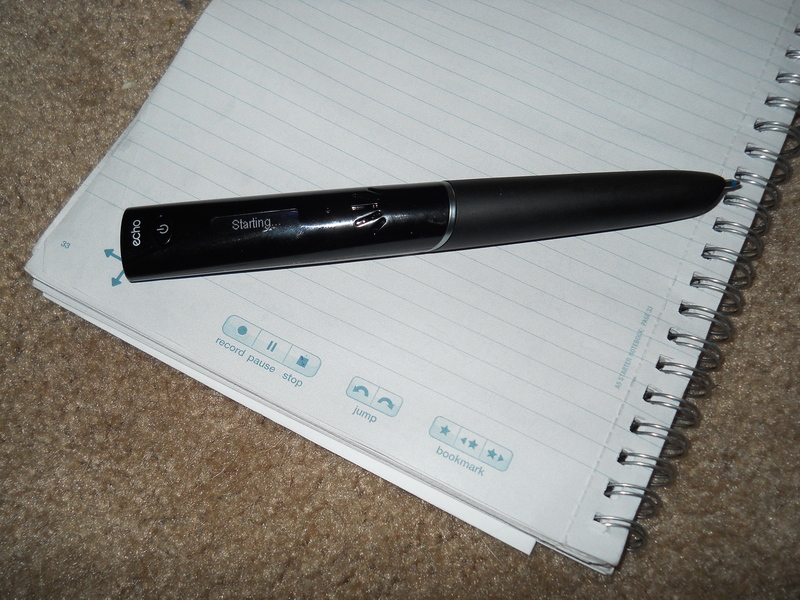 Accomplishment: The Echo Smartpen has become a necessary tool in my reporting arsenal. It completely eliminates the need for a hand-held voice recorder, and since it comes with its own computer software, the ease of loading the information to the computer and therefore into the article makes this one of the best tools I have ever used.